LONDON (Reuters) - U.S. President Donald Trump said he intends to run for re-election in 2020 because "everybody wants me to" and there are no Democratic candidates who could defeat him, the Mail on Sunday newspaper reported. Asked by British journalist Piers Morgan in an interview given on Friday whether he was going to run in 2020, Trump was quoted by the Mail on Sunday as saying: "Well I fully intend to. It seems like everybody wants me to." Trump said he did not see any Democrat who could beat him: "I don't see anybody. I know them all and I don't see anybody." "I did. She said it's a very - and she's right - it's a very complex problem, I think nobody had any idea how complex that was going to be... Everyone thought it was going to be 'Oh it's simple, we join or don't join, or let's see what happens.'" 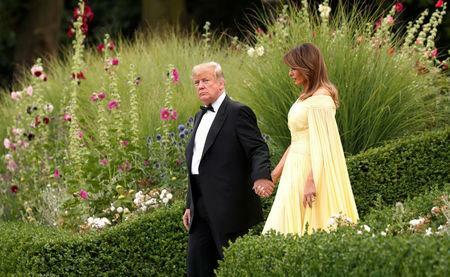 Speaking of the 92-year-old queen, Trump was quoted as saying: "She is an incredible woman, she is so sharp, she is so beautiful, when I say beautiful - inside and out. That is a beautiful woman." Asked if Trump felt the queen had liked him, he said: "Well I don't want to speak for her, but I can tell you I liked her. So usually that helps. But I liked her a lot." "Just very elegant. And very beautiful. It was really something special," Trump said of the meeting. "She is so sharp, so wise, so beautiful. Up close, you see she's so beautiful. She's a very special person." During an uproarious trip to Europe, Trump has harangued members of the NATO military alliance, scolded Germany for its dependence on Russian energy, and shocked Britain by publicly criticizing Prime Minister Theresa May's Brexit strategy. Trump later apologized to May for the furor over his withering public critique, blaming "fake news" and promising instead a bilateral trade agreement with Britain after it leaves the European Union in March 2019. "I think we could probably get along very well. Somebody said are you friends or enemies? I said well it's too early to say," Trump was quoted as saying by the Mail on Sunday. "Right now I say we're competitors but for the United States, and frankly the UK and other places, to get along with Russia and China and all of these other places... that's a good thing, that's not a bad thing. That's a really good thing."